Ahh vacation! 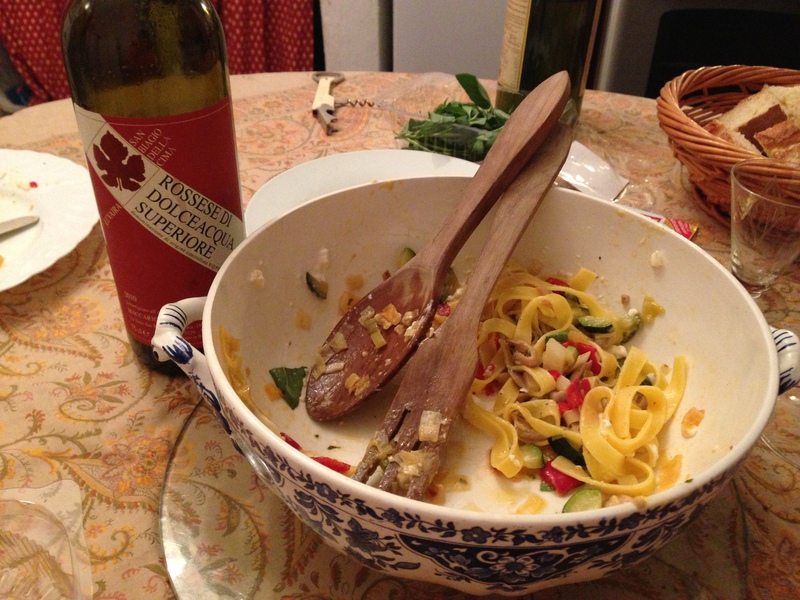 Sorry for the long absence in posts but I was eating my way through Italy last week. Italy is one of my favorite places on Earth- their world revolves around drinking cappuccinos, eating pasta, and drinking wine – all of my favorite things! 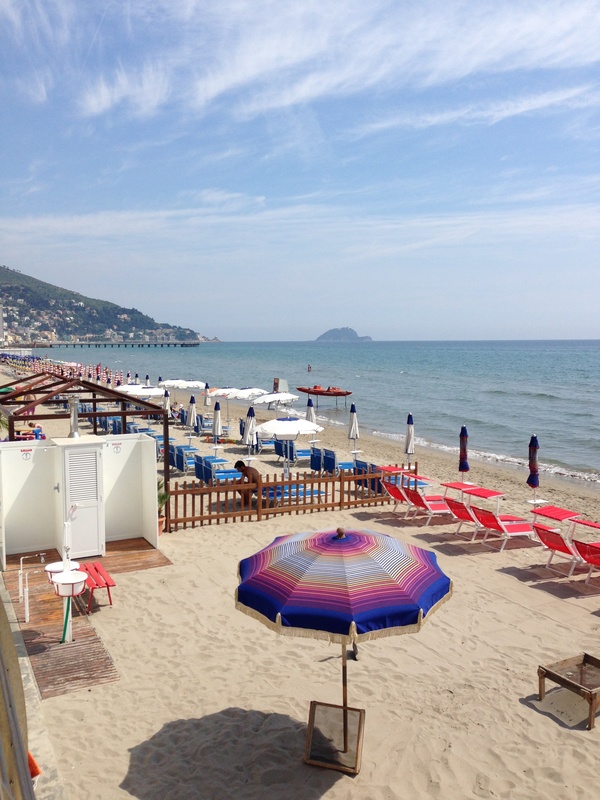 Did I mention they have fantastic beaches? It was the perfect vacation to take my mind of the wedding planning which is now only 1 month away! We had a whole week of visiting with my grandmother which was fantastic! 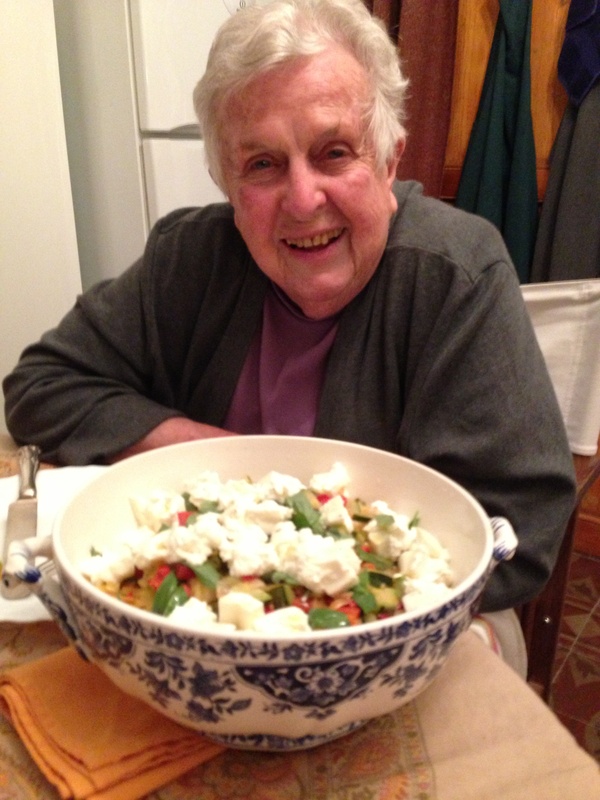 We drank cappuccinos in the piazza every morning and made many meals in her little kitchen. 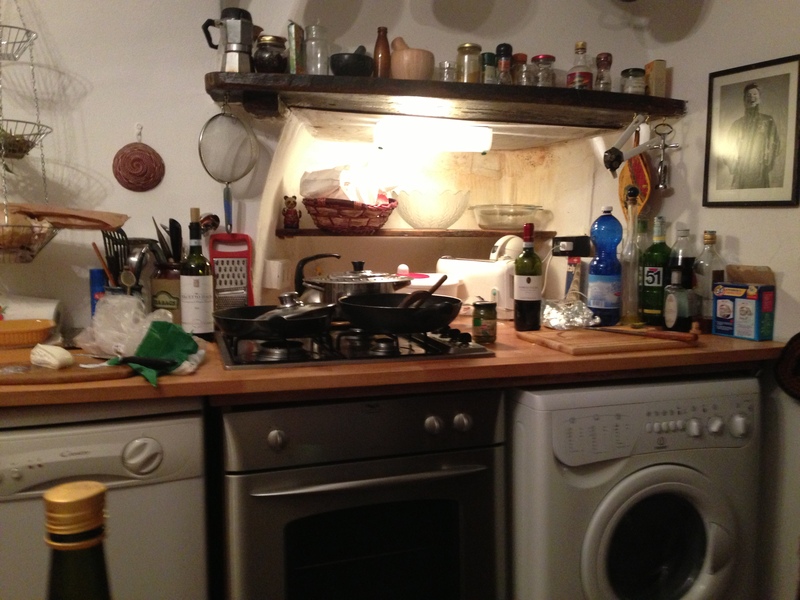 While cooking in a kitchen with limited space makes me appreciate my American kitchen space- it also makes me realize that you don’t need much to make an amazing meal. Much of what we made and ate during our week were fresh veggies and lots of amazing cheeses and meats. Burrata is a kind of cheese that I believe has fallen from heaven. 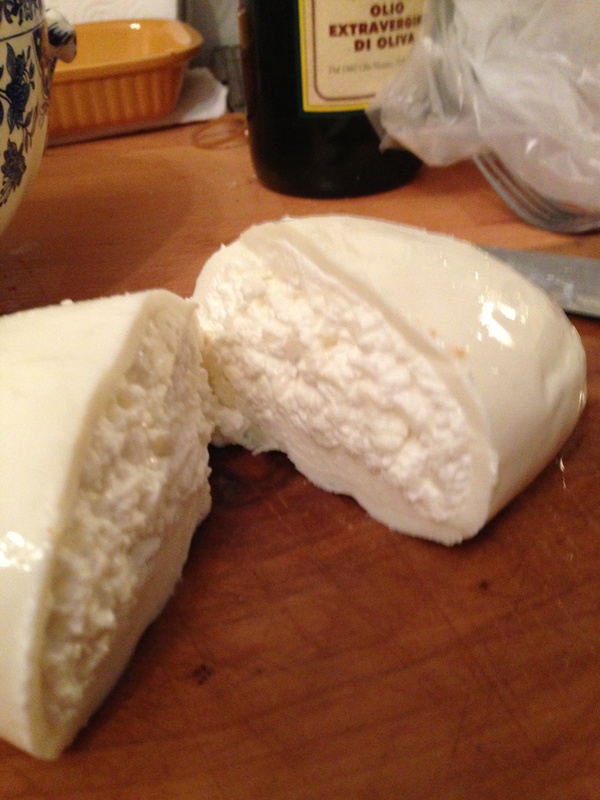 Its a type of buffalo mozzarella made with ricotta so the inside is soft and creamy and it melts in your mouth. For dinner one night I took this amazing cheese and did my own spin on one of my most favorite summer pasta dishes- pasta primavera! Another great thing about shopping in the open air markets in Italy… You can only get whats FRESH and in season. There was an abundance of leeks, zucchini, peppers, basil so I picked what looked good and threw it all together! It was fantastic! I hope you enjoy- we did! Once pan is hot saute leeks, pepper and zucchini and green onions until tender. Add salt and pepper to taste. Add cherry tomatoes last and allow them to roast while all the veggies till tender. Use FRESH linguine like the Buitoni kind in the fridge section. Bring large pot of water to boil and add a pinch of salt and fresh pasta. Once the pasta is al dente, drain it and toss with butter and Extra Virgin Olive Oil and salt and pepper. 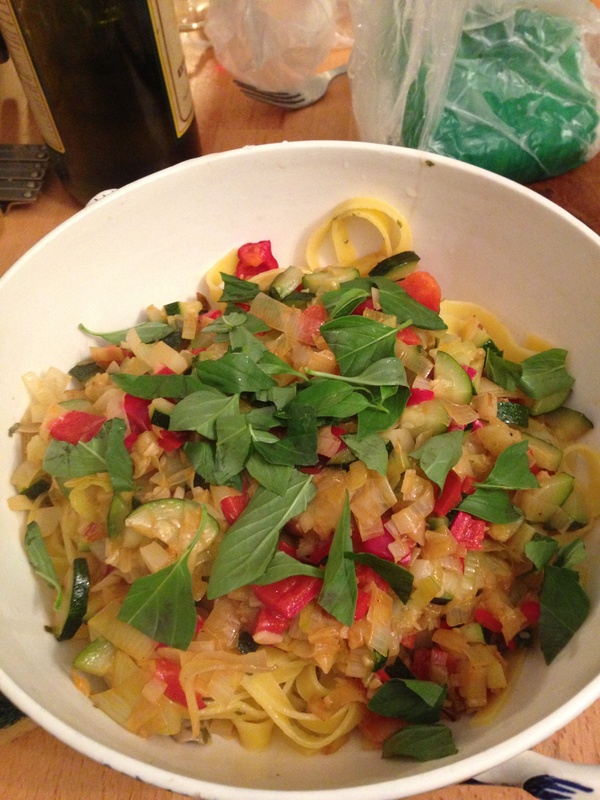 Top with veggie saute and fresh basil leaves – they can be large pieces. Finally- add the BURRATA- on top. You can find it in most specialty cheese shops- Whole Foods usually has it too. 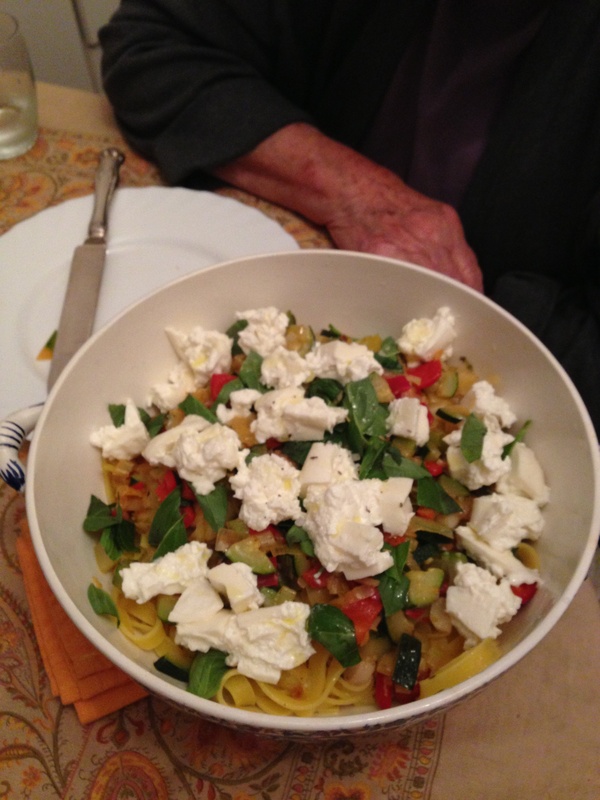 This entry was posted in Entrees, Recipes, Travel and tagged burrata, italy, pasta, Pasta primavera by skibootsinthekitchen. Bookmark the permalink.